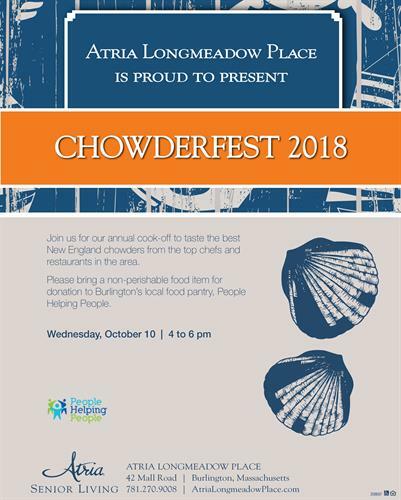 Atria Chowderfest 2018 - Oct 10, 2018 - Burlington Area Chamber of Commerce ? Join us in our beautiful courtyard for our annual Chowderfest and taste the best New England chowders from the top chefs and restaurants in the area. This is not only a fun event but helps support a great cause, People Helping People. This is a FREE event but we are asking for donations of non-perishable food items to support Burlington's local food pantry, People Helping People.